A slapstick comedy on a bomb uproar, and a touching story about the ties between the Nohara Family and their dog Shiro. A film in the musical style including the scenes with inserted songs. When the Nohara Family enjoy a trip to Okinawa, a strange object like a flying saucer becomes stuck with Shiro's bottom. That is a special bomb dropped by "The Only Buttocks Aliens", and it has the power to destroy the whole earth. The space monitoring center "UNTI" (Unidentified Nature Team Inspection) begins to pick up the bomb, but a female terrorist group "Hinageshi Opera Company" tries to get the bomb and disturbs UNTI's work. 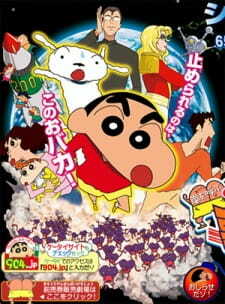 Prequel: Crayon Shin-chan Movie 14: Densetsu wo Yobu Odore! Amigo! If I hadn't known Crayon Shin-chan from the TV Series, I'd probably not enjoyed this. This movie is really primary for kids, but evenso it was very enjoyable, because of the funny and quirky characters and the unpredictable plot (and the catchy songs). A nice movie to enjoy if you don't want to think about...well anything at all. The only thing I didn't like was the kind of forced "drama", but oh well, Shin-chan IS for kids after all.